It was my birthday a few weeks ago and to celebrate I decided what better way than with Zoo Lates at London Zoo! I am obsessed with animals (especially Lions and Penguins) and felt that I just couldn’t pass up this opportunity. The zoo was filled with exciting things to see and do, we started with the animals, in particular the Africa area. We spent probably far too long laughing at an Okapi’s tongue, watched a graceful giraffe, braved the nocturnal section, searched for the illusive sumatran tiger, partied with the penguins, longed after lions and much more! They also had lots of bars, all with a different theme such as the playroom where you could have a wrestling match, hula hoop, play jenga and even twister! There was a silent disco where everyone wears headphones which the music is played through, hilarious to listen too when you take them off and hear everyone singing out of tune. There was also a big international food market with lots of tasty delights to sample. I wore a bright, high waisted, tribal skirt to to give off an African feel and matched it with a bright orange crop top and sandals. I felt quite…naked. I’m not used to going out in such little clothing, but it was really warm and so i didn’t regret it. I even painted my nails to match with the animal theme! The whole event was very well run. There were loads of things to do, not just seeing the animals, the staff were extremely helpful and the atmosphere was electric! The animals started going to bed (or so we were told) at 8:30 and gradually the enclosures were closed off until everyone was in the ‘entertainments’ area for the last half hour. Afterwards we carried on the party in Camden, always a fun place to go. Brii (south african bbq) master Ashley flipping some burgers! For the bbq I decided to dress up a bit still and wore one of my favourite dresses. I bought it at a festival and have always loved the way it poofs out in the skirt. The fabric is also really pretty, I fell in love with it at first sight! I kept myself warm with a cute, batwing cardigan from warehouse. I made these earrings ages ago and found they matched perfectly! I really like the little red and blue beads and was experimenting with using suade, i think they turned out really nice. The bag is from Zatchels and was a suprise birthday gift from my sister! 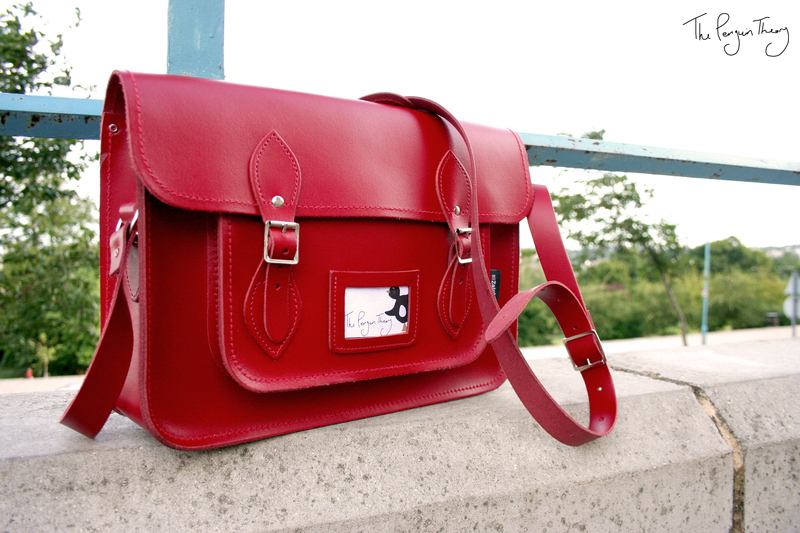 Zatchels are all handmade and just exquisite. I absolutely love it and it even has a little space for one of my business cards to be on display! They come in a wide range of colours and patterns too. It was a really great birthday! Hopefully next years will be just as good! Last weekend I went to a festival called ‘Gentlemen of the Road’. This festival is a little different to normal festivals as it has many different ‘stopovers’ rather than being based in one town. This year it went to 5 different places, mainly in the US but they also had one in Lewes which is near Brighton (UK). The whole thing is the brainchild of Mumford and Sons, one of my favourite bands of the moment. Their music is just beautiful and so full of feeling. I absolutely love them. They designed these ‘stopovers’ to not only enjoy amazing music but also to involve the local people and their culture. This really was apparent as soon as you walked into the venue, and what a venue. It helps that the town itself is also gorgeous. We arrived a day early as we had a long(ish) car ride and wanted to make sure we weren’t rushed in putting up our tent. As we drove through the town we noted how quaint and pretty it was, for any Yorkshire people reading this, it reminded us a lot of Beverly. We weren’t camping at the official campsite but another one called ‘Spring Barn Farm’, a really quaint little farm with lots of animals for kiddies to see and a lovely little farm shop. As we were a day early we were one of the first to set up and so had the pick of the field (at least of the area we were allowed in)! Obviously we went for a nice flat spot with a good view and not too close to the toilets or bins (you don’t want the smell to waft over now do you!). After we’d set up we relaxed with a few ciders and a bbq. A very nice, quiet relaxed evening. The next day the main events didn’t start until around 5, we we’re able to spend most of the day under the baking sun, in our bikini’s, watching everyone struggle with their tents in the heat. It was lovely. We had been informed that the campsites barn had been set up to have a little bar and food area (apparently the bar would be open until 2am!). We didn’t go there for breakfast as we had plenty of bacon and eggs, but we just couldn’t resist the lure of ice cream! I imagine they made a pretty penny with that bar as it always seemed busy, it was definitely a good idea for them and just what the campers wanted! To get to the festival we had to walk for about a mile through fields, I’m pretty sure i’ve walked longer through a campsite at a festival before and so the fact we we’re walking through some pretty fields rather than in between tents was very welcomed. Once we got there the queues weren’t that bad at all, although we had got there early (Again) and so missed most of the waiting it seems. Some people said they had to wait around 45minutes just to get their wristbands! I think that was just down to needing more staff and in all honesty I’ve waited longer at V fest. If that was the only problem they had for the whole weekend then they did a pretty damn good job in my opinion. The whole thing was definitely very well run from what I saw. As soon as we walked in we we’re greeted with rows of waving flags, coats of arms and old style food stalls. It was almost like being whisked back to medieval time, that’s if it wasn’t for the giant glowing letters spelling out ‘Gentlemen of The Road’. It did have a modern feel to an old style and was very in-keeping with the town it was situated in and the grounds (which looked like an old castle or monastery) the event actually took place in. It really set the mood, a great start to a great event. On the first day we saw bands such as Youth Lagoon, British Sea Power and Vampire Weekend. It was a great line up and great start to the festival. Vampire Weekend are always great and we had a good dance and sing along. As always at festivals there was a lot of interesting outfits. The usual festival wear; bright flowers, crop tops, dungerees, plaits, hippie-esq outfits etc… There was also a lot of fancy dress including a couple of bananas, home made t-shirts as well as a lot of merch t-shirts bought and then immediately worn. I took a lot of pictures of the festival fashions (which made me feel oh so stalker-ish) and will be doing a blog post on the do’s and don’ts of festivals and festival fashions in the near future. The best hat i’ve ever seen…most likely. All too soon it was time to head back to the campsite. The way was nicely lit and they had lots of marshals to make sure you didn’t get lost. The next day started just as relaxed as the day before. The arena didn’t open until the afternoon leaving us plenty of time to sit around and get ourselves ready. We bought some posh bread and Brie from the farm shop, we we’re living the dream and felt very middle class. We had the brie with some bacon and rolls we had leftover for breakfast (it was mouthwateringly amazing) and then saved some of the brie and the fancy bread to take into the venue as nibbles. The line up on the second day was again amazing, including Edward Sharpe and the Magnetic Zeros, The Mystery Jets, The Vaccines (one of my mums favourite bands) and (of course!) Mumford and Sons. There were also some lesser known bands playing. One of my favourites of these being Bears Den who had some Hauntingly beautiful music. By the time Mumford and sons came on we could barely see the stage, but we didn’t care. All the performances we’re amazing, everyone really put a lot into it and it was obvious by the crowds reactions that their time and effort was much appreciated. Usually at a festival you find that there’s at least one or two acts that just aren’t all that great, they don’t seem to want to be there or just aren’t very good live. But every one of them was brilliant. Maybe it’s because it’s quite small compared to others so the acts are more carefully selected, but it definitely made the whole experience a lot more enjoyable. At the end of Mumford and Sons set they invited ALL the other acts onto the stage and they all jammed together! It was incredible. Then the after party started with ‘The Very Best Sound System’ which was very dancey with an african feel. Definitely a great end to the festival. The whole thing was just so well put together, Mumford and Sons (and their team) have done such a good job. We ended up partying well into the night and had a lazy morning whilst watching everyone pack up their tents. All too soon we too had to pack up and leave, I was sad to leave after such an awesome weekend but was most definitely looking forward to a shower! If one of the Stopovers comes near you then I highly recommend going! (as long as you like the music of course).It was such an amazing weekend and I will most certainly be going next year if they’re around again! So thank you to all the organisers, Spring barn farm and Mumford and Sons for a really great weekend away! I hope to see you all next year! I was 3 hours away from my home, my legs we’re aching after running up a steep hill and I was all dolled up in a pretty party dress and heels frantically trying to get in touch with a friend. It all started weeks ago when my friend, and artist, mentioned an evening event at a gallery her art was being shown at. 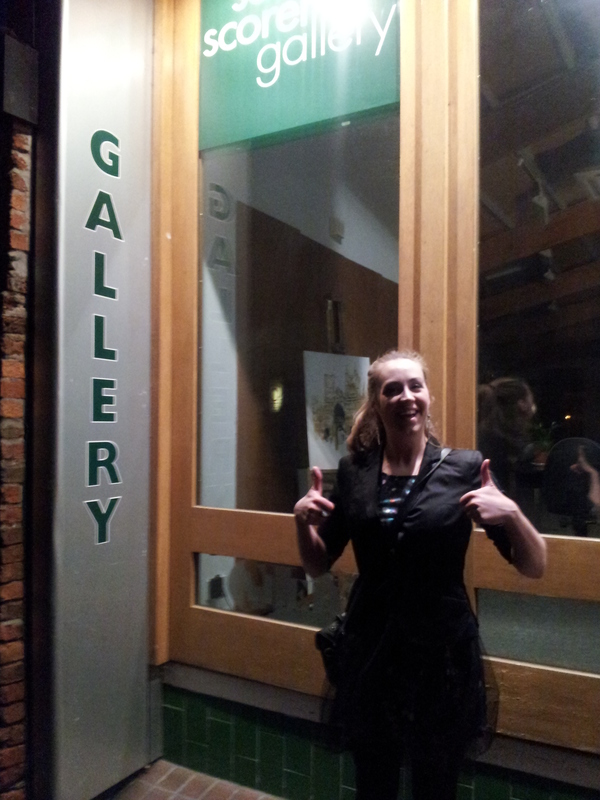 In passing Ash suggested that we surprise her and turn up to the gallery without her knowing. I looked at my Rota and I finished work early enough on the day to be able to get there just in time, plus I had the day after completely off! So then it was a waiting game. I couldn’t wait to see the look on her face when we just randomly turned up, and I very nearly told her of our plans several times. I was just too excited! On the day I finished work at 4, then I had to run some errands, post some packages, pack my bags. By the time we left it was 5:30 and we we’re definitely now in a rush. The drive was surprisingly easy, just the A1 for most of the way. We got there and it had seemed like the event had been cancelled, katy wasn’t replying to texts as she was other wise occupied so we decided to walk to the gallery anyway. As expected it was closed, eventually I rang Katy and asked if she minded two people imposing themselves on her. She was very shocked but luckily seemed delighted that I had travelled to see her. The next day myself and Ash left Katy to go to and open up the gallery before joining her later in the day after a bit of breakfast and sightseeing. Her gallery really looks amazing. I knew her paintings we’re gorgeous, but they look even better in person than in the photographs! The colours she uses range from natural earthy tones to bright dazzling rainbows. Every painting uses colour to great effect, really catching the eye. The subjects are superbly drawn in a messy but elegant way, really giving life and movement to the pieces. I know I may be biased, but I really do love her Art and I believe it speaks for itself. CR : What did you want to be when you were younger? KD : Well originally I wanted to be a horse, then a tooth fairy, and then an olympic gymnast, but I’ve always wanted to be an artist. Always, always. CR : That is adorable! So what was it about Art that interested you? KD : Well, I would say its whatever is suggested in art, the small things like a glance, or a certain positioning, or the way that not everything is recorded in a painting but it is suggested and you can fill in the blanks yourself in any way you want. KD : Sometimes, before I am inspired by the subject, I am more inspired by the want to paint something of a particular nature (powerful, strong or soft and calm) and then the decision the work on a particular subject and the research behind that is then the inspiration to actively get up and do the painting. I’m also inspired by artists like Odilon Redon who can work in dreamy and ethereal ways, thats why my work isnt always an accurate depiction of a scene, I like to add a dreamy quality to it. CR : When you’re not painting, what do you like to do? KD : Painting is quite a solitary process so I like to be around friends a lot. I like to go out for walks when it’s sunny, walking a dog, going out for food and drinks or getting inspired by other artists. CR : What have you found to be the most challenging with your art? CR: What can we expect to see from you in the future? KD : Oh gosh! Well I have lots of ideas for collections, some conflicting ideas but all seem to relate back to my own style. As I experiment with other materials to work on I might see a shift in technique and therefore, maybe, some new styles. But for now I am still figuring that out, I will have to see what happens in the future and how my work translates into prints and merchandise. 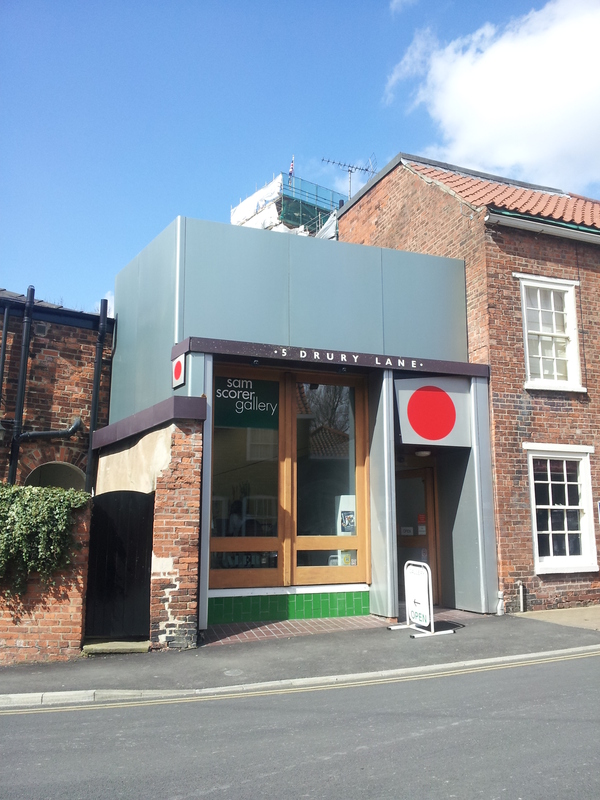 You can see Katy’s Elegant Mess Exhibition at the Sam Scorer Gallery in Lincoln until the 14th of April. Or if you don’t live close enough you can follow her wordpress here, find her facebook page here and her official site here! Sorry for the brief absence, between long hours at work and being sociable I seem to have neglected my blog. I promise I made the most of my free time whilst I wasn’t updating though. Wrapped up warm, eating chocolate! 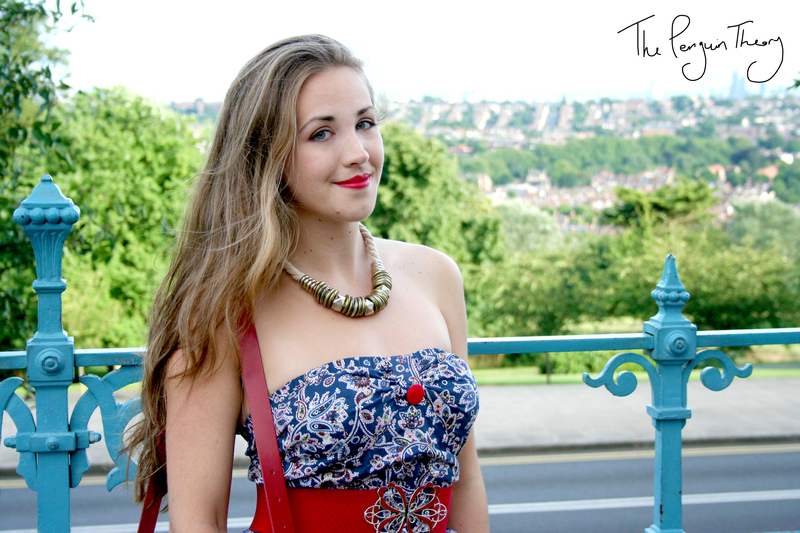 Last weekend I met my sister on the southbank and went to a chocolate festival! There were so many stalls selling all kinds of chocolates! Gifts, snacks, quirky little things, big delicious things, solid things, liquid things. You name it, they had it (in chocolate at least). I bought an amazing Lion shaped chocolate I just don’t dare eat (i will have to take a photo for you all to see!) and we bought a bag of flavoured chocolate lollypops. Emma and I then decided to retreat to the warmth of a pub and chat over a bottle of very tasty wine. Ash and my sisters boyfriend then met up with us for some lunch. Ash and Sam were men and had steaks, I had some delicious scampi. 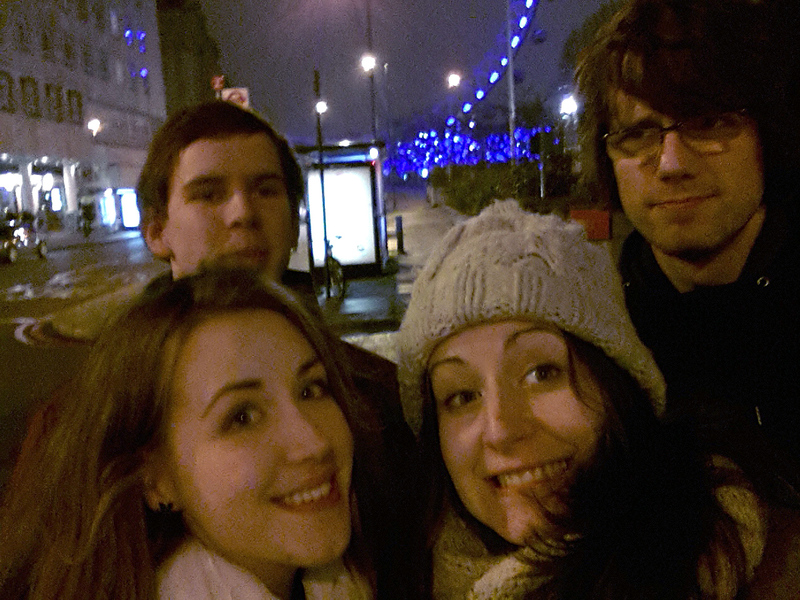 It was really nice, and the first time the four of us have done something together. The boys talked gaming and we all had a nice chat about TV shows we watched, soon though we had to leave. My sister had a party to go to and we’d invited some friends to a RollerDisco, the very same place Ash and I went on our first meeting. The Rollerdisco was brilliant as usual although we left earlier than I wanted, probably for the best as I had work the next morning. Again we didn’t dress up and again I wished I had! There were some truly awesome outfits, lots of flares, bright colours, super heros. My favourites by far were the group dressed as retro games. My two absolute favourites being Twister and the Rubix Cube. This girl had made a very pretty dress out of twister fabric. It was simple but it didn’t need anything else. 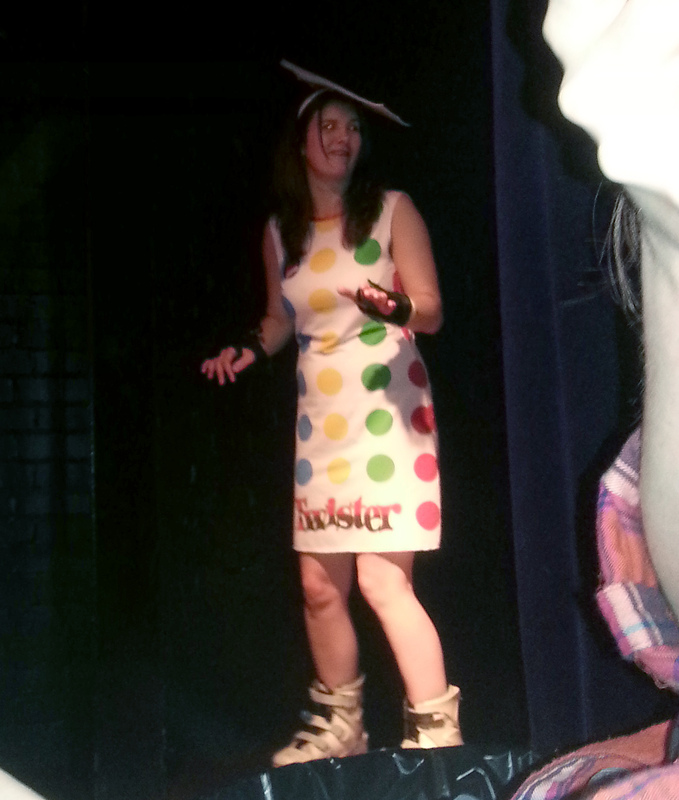 She also wore a Twister board on her head, very creative although it looked a bit like she had just graduated! This outfit was just so quirky and brilliant I couldn’t resist a sneaky shot! I wussed out at actually going up to the girl and getting a picture with her though, kinda wish I had now. She wore a Rubix Cube on her head and had a matching handbag. Her dress was a retro, colour block number and was pretty stylish as well is fitting in with her theme! I think I might have to steal this in future, i just loved it! She looked fab! 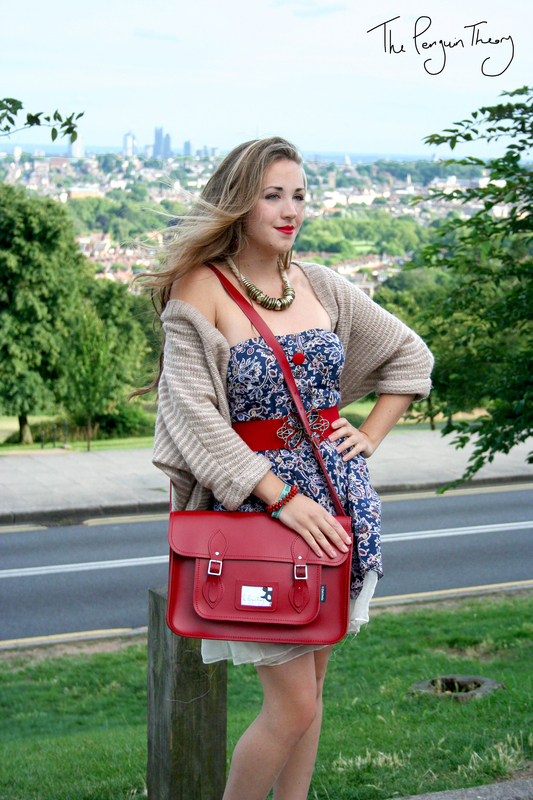 Don’t forget to enter my competition here or here! My boyfriend has finally started University! Unfortunately his loan hasn’t come through yet, but hopefully it wont be long. His Freshers Ball was in the Theme of the Prohibition Era. Luckily I had the night of work because I was so excited to dress up in tassels and big feathery head pieces! Unfortunately I ended up working a lot before going (4 people have just left my work including one of the managers meaning we’re pretty low on staff) so I didn’t have time to buy the amazing outfit I had envisioned. Instead we had a quick run to Camden on the day to of the ball as we figured it would be the best place to find some vintage looking outfits. I did see some lovely and perfect outfits but unfortunately my budget would not allow for them. I also saw some cheaper outfits which again would have been perfect but I just couldn’t justify spending £20 on them when I knew I wouldn’t wear them again. In the end I settled for a cheap cream lace number. 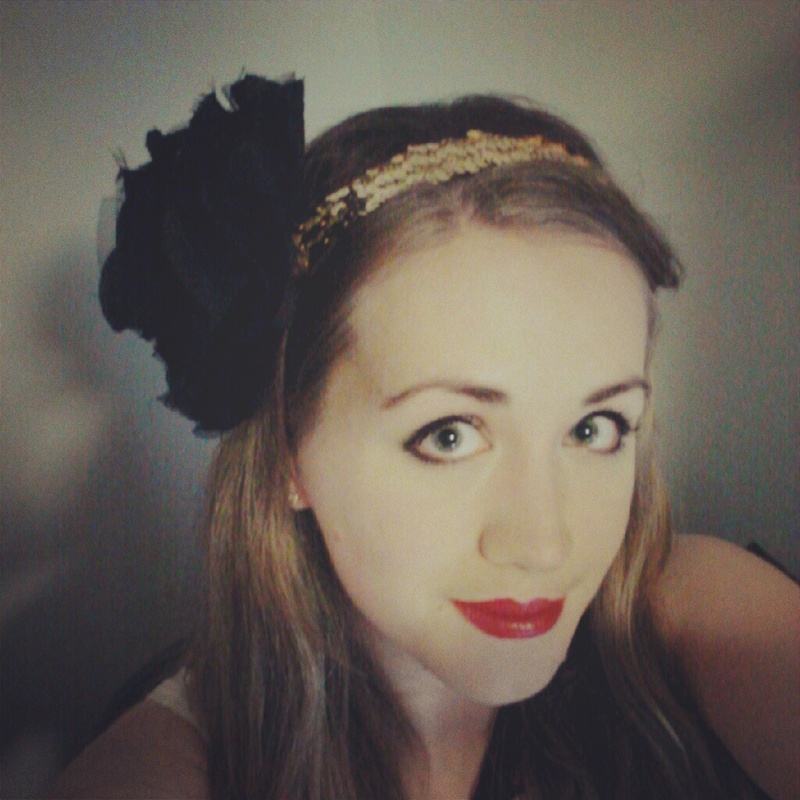 It didn’t quite fit the style (it had too much shape to it really) but I figured I could make it more 1920’s with some accessories and make-up. 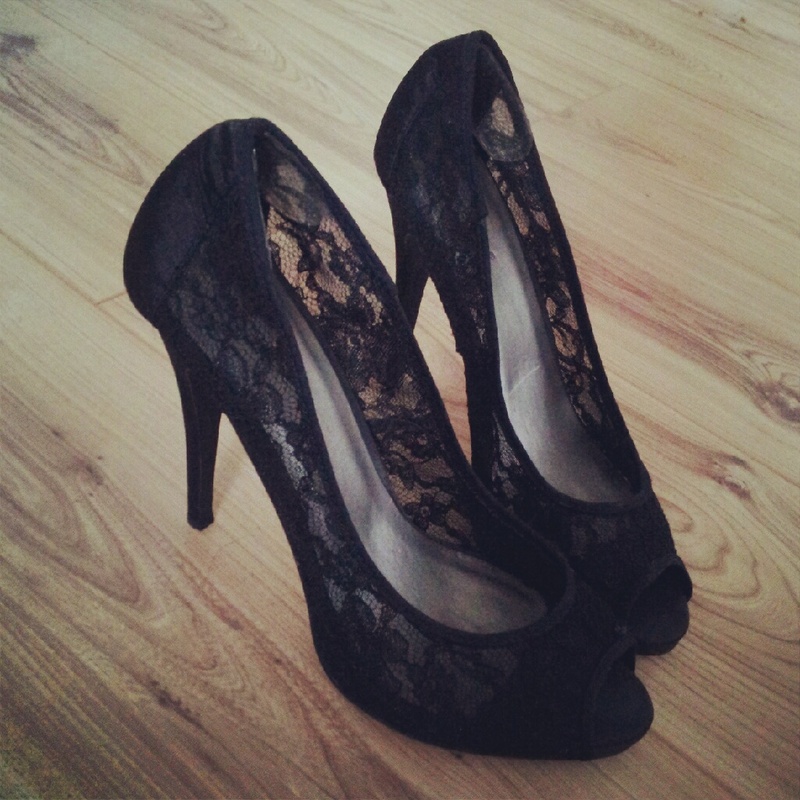 I knew I had some shoes somewhere that we’re very 1920’s, but unfortunately I seem to have left them in the north so I settled with some matching lace heels. I ended up tying a ribbon round my waist, not all that 1920’s but it looked pretty and gave me a big bow on the back (I love big bows!). 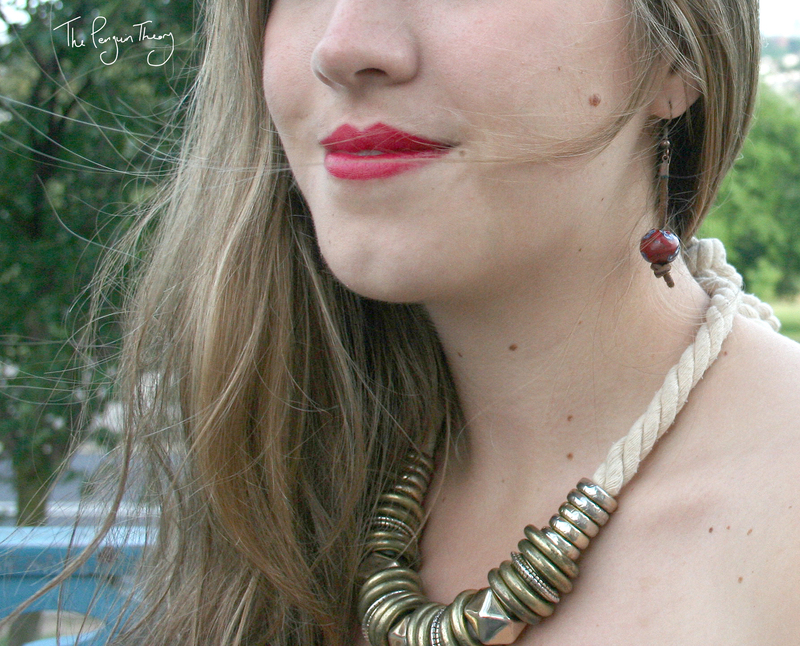 I also wore a few long, beaded necklaces to try and make up for the lack of tassels. 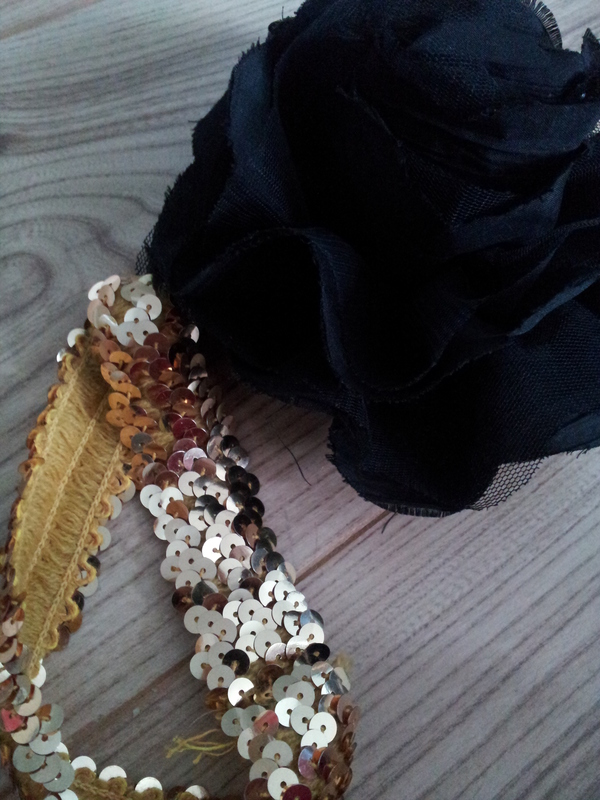 For the headpiece I used an old sparkly headband I wore when I danced the charleston with my old dance school (how appropriate!) and attached a big flower to it as I didn’t have any feathers. For my make-up I made it quite simple just adding some eyeliner and then bright red lipstick. I wasn’t about to cut all my hair off into a 1920’s bob, so I just left it as it was, straight and long. Considering my lack of time and money I think I actually looked pretty good! It turned out to be a really good night. Just him and I dancing like idiots whilst getting a little merry. It’s a shame the journey back wasn’t quite so fun. Our flat is really hard to get to with the night buses. This meant we had to take 2 buses and then walk for 40 minutes, which wouldn’t be too bad if it wasn’t freezing and absolutely pouring it down with rain. 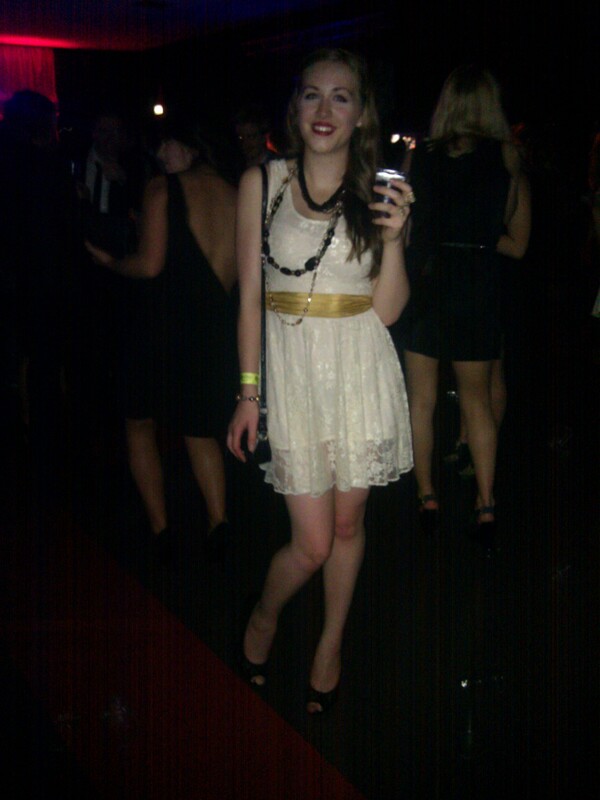 Hopefully there’ll be many more good nights out soon, if I’m not working too much that is. I’ve been neglecting the penguin theory for the past week, I’m actually writing this on my break at the day job! partying in Camden. We had loads of fun and it was a really good night out, there were one or two hitches but in the end we all got nicely drunk and enjoyed the night. his birthday its actually today, Sunday, and I’d planned on spoiling him all day. Unfortunately my shift was changed at work and now I’m working for 12 hours. I guess I’ll have to pamper him another day. something to do with sewing like an alterations shop. I’ll just have to see what there is for me out there. As you will know, if you read my last update, i went up north as I was invited to a friends wedding in Lincoln! The wedding the next day was nice. Thankfully the weather was beautiful! (It had rained the day before). The ceremony was very…modern christian. Lots of christian rock and even a powerpoint presentation! Not really my cup of tea (I’m a bit old fashioned and prefer the old style hymns), but still lovely. It’s hard to make a wedding ceremony bad lets be fair. The reception afterwards was gorgeous! It was in a hotel with some beautiful grounds. Photo’s were taken outside in the sunshine and then we all went inside to eat. There was pork (as though it had been pulled off a hog roast) and lots of salads, wedges, couscous. Everything was delicious! The rest of the night was spent flitting between rooms. Outside there were lots of benches and was perfect for sitting down and talking, although it did start getting very chilly. Inside there was a room set out with tables on one side and the other had room cleared for dancing. Lots of tunes were played ranging from old cheese to rock and even lots of dance tunes. Very good for getting people of all ages up and dancing! The was another room inside as well with lots of comfy sofas. I ended up on one of these sofas near the end of the night and very nearly fell asleep. The day after I thought I should go visit my mum whilst i was nearby (or at least closer than London). Unfortunately I could only stay for a day but I did manage to cram a lot into it! I walked my aunts dog, visited my grandparents, helped my mum buy an outfit for a wedding she’s going to, and met up with my other aunt and cousin. Muddy George looking very pleased with himself. I was actually quite sad to leave and come back down south, but I think Ash was beginning to miss me. Plus I had work the next day. The 27th was my birthday and also happened to be the date of the Olympics Opening Ceremony. Obviously this meant a party was needed. I invited a few friends around, gathered some snacks and alcohol and made sure the tele was on the right channel. We played some fun olympic drinking games whilst watching the ceremony. The ceremony itself actually surprised me, in a good way. I don’t know quite what I was expecting, but that wasn’t it. It far exceeded my expectations. At first I wasn’t so sure, the whole arena looked like a field and, although the performance was good, I couldn’t see how much they could do with the set as it was. But then the towers majestically rose out of the ground and the whole stage was transformed seamlessly. Then later James Bond goes to see the Queen. At this point everyone in the room were arguing as to whether or not it was really the queen. Then she turned around. We were very impressed. Thinking this couldn’t get any better, we all stared in disbelief queen jumped out of the helicopter! We we’re all in fits of laughter. I’m just sad that they didn’t get a stunt double to actually parachute down. Then it got even better with Rowan Atkinson appearing as Mr Bean. I was obsessed with Mr Bean when I was younger and I made sure no one spoke whilst he was on screen. I always find it amazing that he can create so much laughter without even speaking. He is truly a talented man. 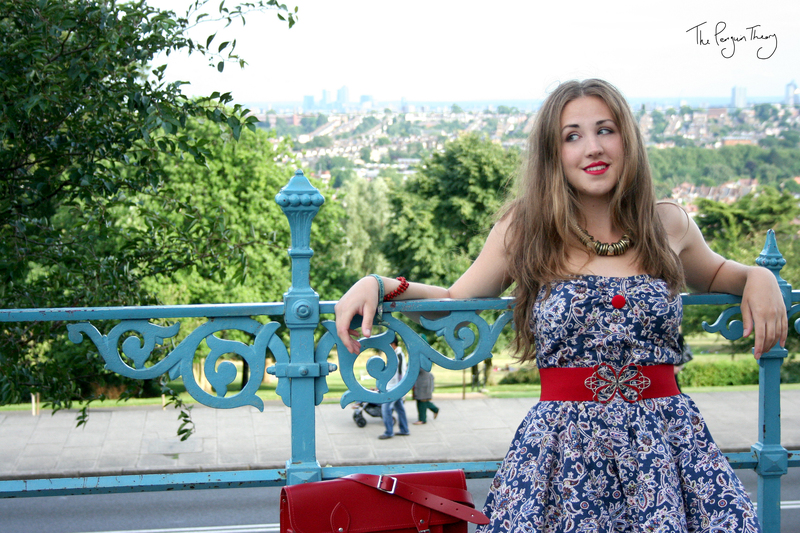 Eventually we went out and about in Camden and had a good boogie. Partying in Camden with the extremely attractive boyfriend. If you read my last post you will have seen that I mentioned that my family had put a lot into the penguin theory. That is certainly very true, they’ve always been very supportive. It was my sister who first got me involved in making jewellery by taking me to a bead shop in Leeds. There were so many pretty shiny things I immediately wanted to make something pretty and bought lots. When I first mentioned that I wanted to start sewing it was my mum who bought me my first machine last year. Just a small, cheap (for a sewing machine) john lewis model, but perfect for a beginner. I’m usually not the best at keeping up a hobby (I seem to get bored rather quickly and give up once i find something that’s hard) so I definitely didn’t expect anything more. But for my birthday this year my mum and her boyfriend completely stunned me. They bought me a brand new, full sized, 39 stitch, electrical sewing machine. For them to get together and buy me something it must have cost a lot and I can tell this is quite a good sewing machine. I’m so excited to use it! It’s made me feel really motivated. The amount of money they must have spent on my hobby and has made me realise that I have to keep at it and do well, or more that I can. My aunt also bought me lots of books about selling online and at craft fairs which are proving to be very useful. In fact I think I will do book reviews of them all in the near future for anyone else thinking of buying them. My family have always supported my sewing, buying things off me (my sister recently bought some bunting, my aunt bought some bibs), complimenting my products, telling all their friends to look at my facebook page. My boyfriend is even helping out, forcing me to do the admin and even helping when i’m stuck drawing a pattern, he really has been a life saver at times. I really am grateful for the support they give me and probably would have given up long ago if it wasn’t for them. Yesterday I also got involved with the Olympics! My sister and her housemate had a spare ticket for volleyball so I of course decided to join. We saw the mens Swiss vs Russia and USA vs Poland followed by the Womens Australian vs Austria. Unfortunately we had to leave then as the others needed to get up early and so missed the last match, but it was an amazing experience! The atmosphere was electric and the players were brilliant. Lots of dancers came on during the breaks and got the whole crowd moving. Definitely was an exciting experience and I’m delighted that I had a chance to go. On the way home we actually saw the swiss team going back to their hotel. We congratulated them on their win and managed to get a photo with them! They were super nice guys (and extremely tall! ), definitely backing them for a medal. Being English I’m obviously not going to be able to get away from the jubilee and will more then likely attend some kind of party to celebrate the event, even if i am going to be out of the country for the start of the celebrations. So here are a few items I found around Etsy to help us get into the jubilee party spirit! What british party isn’t complete without bunting? I love the vintage feel of this particular bunting and it would definitely suit this event perfectly! No one can deny that Geri Halliwell wasn’t patriotic, so why not make yourself a more *ahem* classy version of her Spice Girl days. This dress looks beautifully made and definitely makes our flag seem very stylish! The queen is known for loving Corgi’s, so why not spread the love with this adorable necklace pendant? I just love the intricate detailing which makes this cute pendant just a little bit special and regal looking. This denim tote bag would be perfect for carrying all your jubilee party items, not to mention a very stylish bag all year round. There is no queen without a crown, as this listings name tells us. And this dainty little ring is perfect for making you feel maybe just a little bit like royalty. If you’re hosting a tea party for the big day then why not decorate your room to match the theme with this adorably vintage looking garland! It’s bound to become the talking point for any gathering. One for the men, we can’t leave them out of the celebrations after all. These cufflinks would be a very patriotic addition to any suit. All that’s missing is a union jack tie. If the men, however, cannot find a tie, then this ring would also be a good choice. 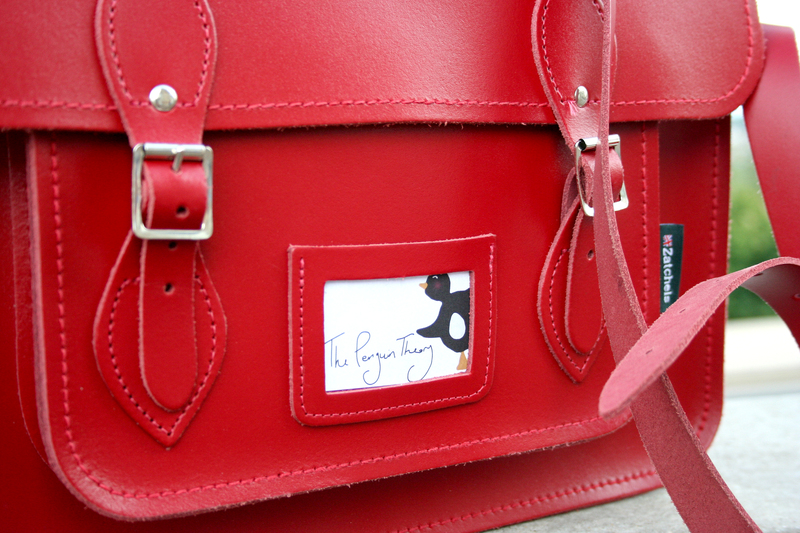 It’s available in a range of colours and customisations. However, if your man wants to make more of a statement (and doesn’t mind forking out a lot of money for it) then what about this jacket? I can almost imagine an old fashioned british army officer wearing this. Obviously you’re going to need a hat for the special day as it seems all big posh events require some kind of head garment. How about this cute little number, it matches the colour scheme and is bound to make any outfit a little extra special with those cute bows. Its the Diamond jubilee so we obviously need some diamonds, these Herkimer Diamond earrings may not be real Diamonds, despite the name, but we can’t all afford the real thing can we? These will still give an amazing sparkle to your earlobes. The gold casing even makes these seem just a little crown like! As there seems to be a lot of talk about ‘Tea Parties’ obviously you’ll need a place to store your tea. This mug seems to do the job, complete with a choice of two commemorative designs! Of course after the gallons of tea us Brits will obviously be drinking, you’ll need to wash up the mugs. What better than a matching jubilee tea towel? Especially one as snazzy as this! You can never have enough bunting, so why not decorate your neck as well as your house! This cute bunting necklace comes in 3 different patterns. You can never have too many corgi’s! At least not if you’re the royal family…And this brooch would be the perfect way to decorate your union jack dress or bag. I’m sure you’ve all wanted to use your fluffy corgi as a cushion before, right? This cushion is not only cute and comfy, but it also doesn’t wriggle as much. I hope you like these items as much as I do.